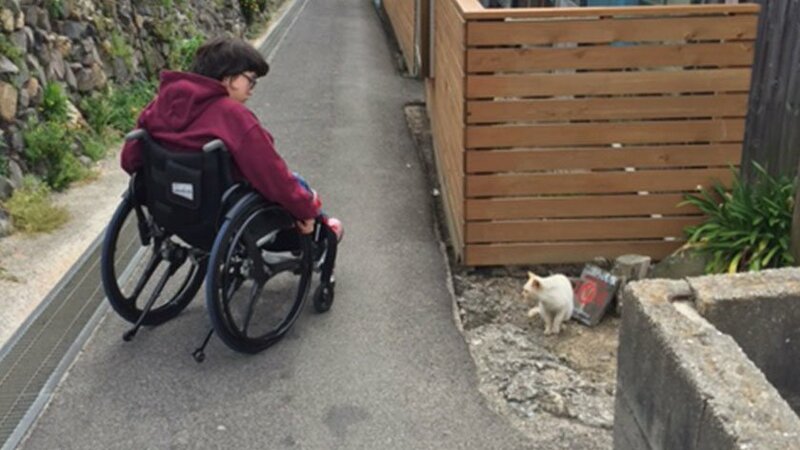 My friend Lance warned me that Ogijima, with its steep slopes and narrow alleyways, was not particularly accessible for wheelchair users, but I decided to take my daughter there for a visit anyway. Ogijima, one of the many tiny islands scattered across Japan’s Inland Sea, takes part in the Setouchi Triennale, an art festival held every three years. 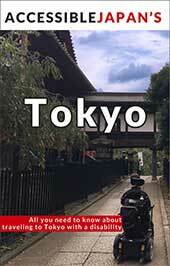 Although I’ve lived in Japan for 28 years, I’d never visited any of the islands until very recently. I had yet to set foot on Ogijima, which is located about forty minutes by ferry from Takamatsu (510 yen one way for passengers on foot). I made plans to meet up with my friend Wendy and take my daughter Lilia to check out some of the art on display. Tip: Go to the ferry terminal early in festival season! Although it was a weekday, a long line snaked away from the dock. People come from all over the world to cruise the islands and see the creations of international artists. Luckily, Wendy had joined the queue half an hour or so before we arrived and saved us a spot in line. The ferry to Ogijima is a double-decker. Automobiles go on the first level. Most passengers get out of their cars to enjoy the scenery from the top deck, but there were only stairs. A steward showed my daughter and me to the “Silver Room,” a windowless wheelchair-accessible room at the rear of the first level, where we waited out the journey with mostly elderly people. The room had an adjacent accessible bathroom. 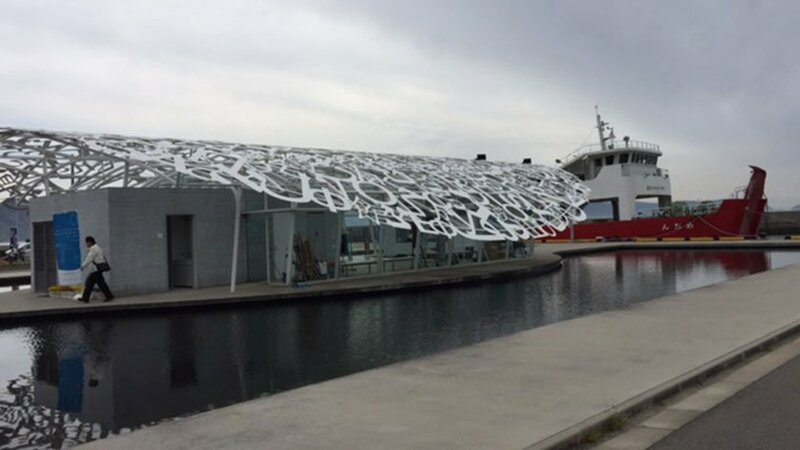 Once we’d arrived in port, we popped into “Ogijima’s Soul,” an artspace with a white filigree roof, designed by Barcelona-born artist Jaume Plensa, which houses the visitor’s center for a map. The island is only two kilometers long by one kilometer wide, but it is a little hilly、The biggest attraction seems to be a white lighthouse, which appeared in the film Times of Joy and Sorrow directed by Keisuke Kinoshita. Getting there, however, was a bit of a climb. A woman at the vistor’s center suggested we explore the flatter southeast area of the island, where several artworks were located. We were able to navigate the narrow back alleys, though we had to occasionally move aside to make way for oncoming pedestrians. 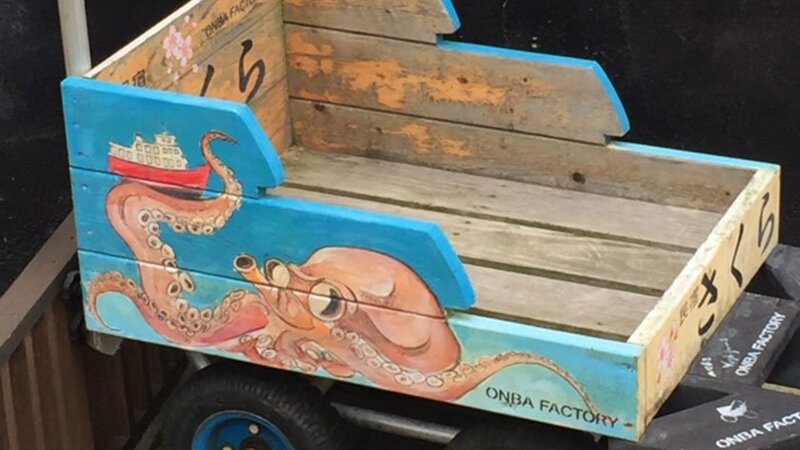 We came across whimsically painted wooden buggies (onba), numerous stray cats, and “Dreaming of Blue,” by Brazilian artist Regina Silveira, which is painted on the exterior walls of a school. 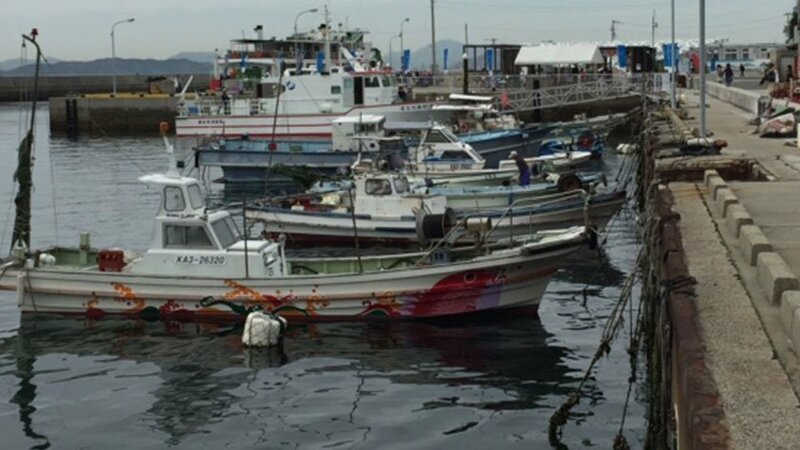 In the port area, we stopped to play with the cats and have a look at the brightly painted fishing boats. Further along the shoreline, we came across Keisuke Yamaguchi’s whimsical “Walking Ark,” which looked like something out of a Ghibli film. By this time, we were starting to get hungry. We headed back to the port. Wendy had a restaurant in mind, but as it turned out, it was up a steep hill and it was closed on that day. 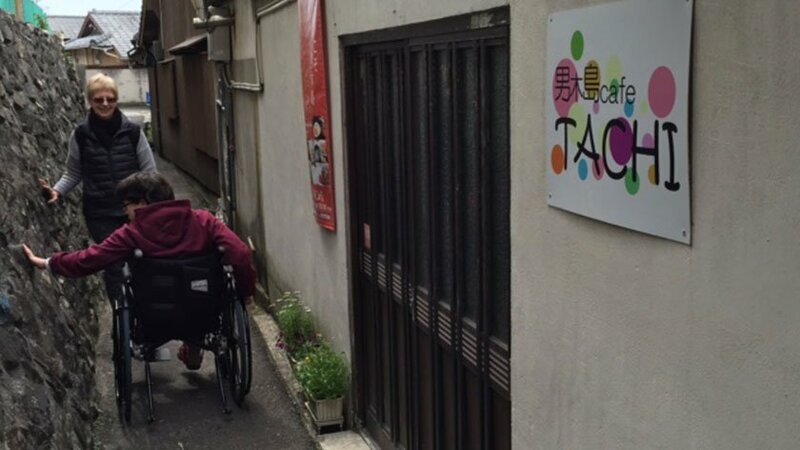 We backtracked to Café Tachi, a mom-and-pop restaurant we’d spotted in an alley. 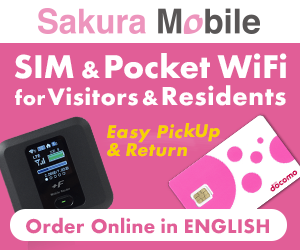 Although it was too small and narrow for a wheelchair, and the dining area was on tatami mats, the owners were welcoming. We parked the chair in the entryway, and Lilia crawled a very short distance to the table. 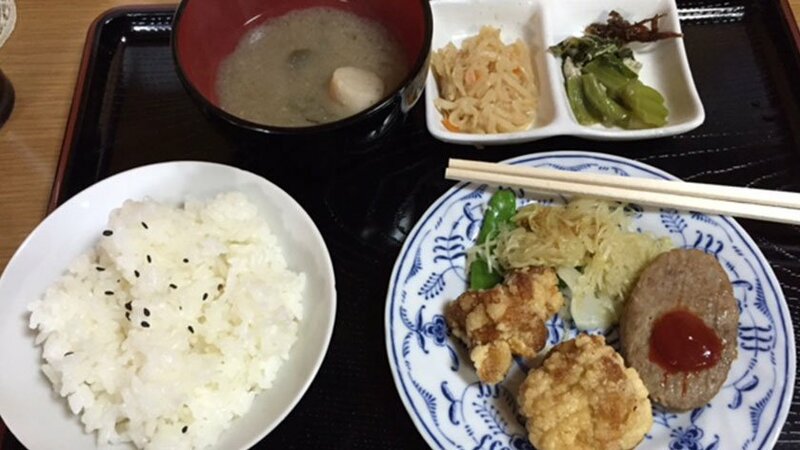 The menu was limited, but the food was hearty and delicious – and cheap! 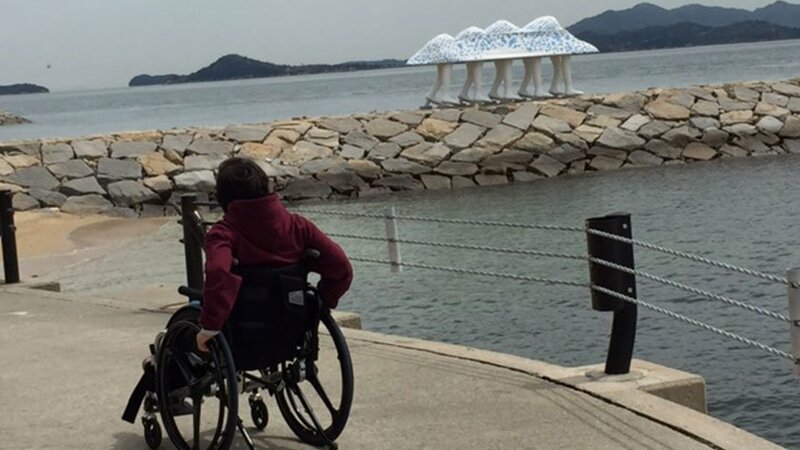 We didn’t even try to enter the old houses converted into artspaces, assuming that the genkan were not wheelchair accessible (as on other islands), however, we enjoyed a leisurely day amidst the beauty of nature.